It was mainly a good week wax wise with the exception of one. These are some I've melted before just never reviewed and one that was new to me. I'm trying to hold off too much on holiday wax because I really go into it too quickly recently. I don't want to burn out on them too much before the real holiday season hits. That doesn't mean I won't be melting any though! My Thoughts: This is exactly as describe and perfect blend of lavender and rosemary. I love herbal scents like this as I find them soothing and calming. This had a strong throw and lasted in my warmer about 24 hours before fading! Two thumbs up! My Thoughts: This is a very authentic melon scent. I know some melon scents can be so artificial. This has a very refreshing, sweet, and clean watermelon scent with a touch of kiwi. I normally don't like overly sweet scents, but melon scents are a bit different. Melon scents have that really refreshing watery note that balances out the sweetness. This one had a strong throw and lasted several hours. My Thoughts: This is a definite ocean and water scent, but it has this touch of men's cologne to it too. I really like this blend and don't find that men's cologne note to overpower that refreshing aspect of this scent. I love clean scents and this another great one. This one also has a strong throw. My Thoughts: This smells just like herbal tea. It's soothing and clean. I like it. There isn't much else to say about it. It has a strong throw like that other ScentSationals above. If you like clean and soothing scents you'll like this one too. Scent Description: a charming fragrance filled with surprises the senses with plums, dark cherries and sweet oranges enhanced with peppery woody undertones. My Thoughts: I'm 100% sure this is the same scent as TDC Plumberry Spice. They have different scent descriptions, but they're the same scent. I like it just as much as I like Plumberry Spice. It has a very festive berry fruity note mixed with some woodsy/green notes. It's a great blend for the holidays! My Thoughts: I saw these wax melts at Target. They're a bit more expensive than the ones at Walmart at $3.29. I LOVED this on cold sniff. This is a straight up lavender scent. It's a very pure and natural lavender too. It has that mix of herbal and soapy qualities that I love. 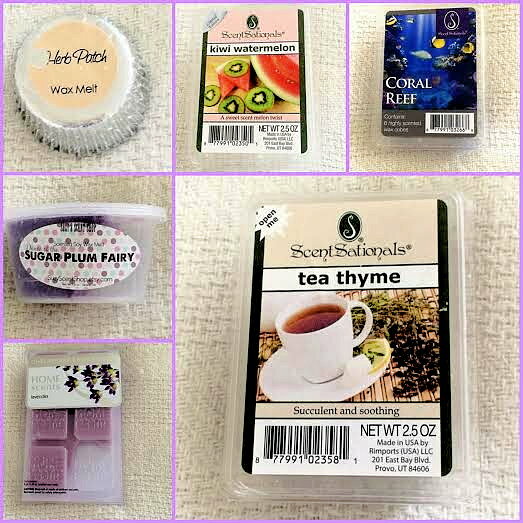 I find it hard to find just straight up one note wax melts, and I was excited to find this. That being said, this had absolutely no throw at all when melted. I could not smell it unless I put my nose one inch above the warmer. This was such a disappointment as I really liked this scent. That's it for this week's melts! See on the flip side!